For as long as sofas have been big enough to sleep on (late 1600s, France) it’s safe to assume somebody in a relationship was sent there to tough it out after a fight. Cut to today, and a recent survey of nearly 3,000 British people found that on average, 66 nights of a marriage are spent with one member of the couple sleeping on the couch. The notion that two months of married life are spent sleeping apart is a little troubling — but who’s doing all this couch sleeping, and why? Though no research has nailed down a clear picture of the gender couch divide, recent data tells us that some 15.4 percent of the nearly one-quarter of couples who sleep apart (on the couch, or in a spare bedroom) do so due to fighting (the rest do so because of snoring, medical issues, children, or conflicting sleep preferences). 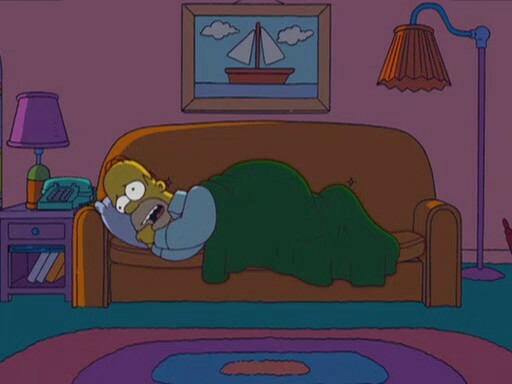 The site TV Tropes, which documents the hundreds of recurring themes in TV shows, calls this trope “exiled to the couch,” defining it as “a common scenario amongst married and other live-in couples. Husband and wife are in an argument. Argument escalates. Husband/wife makes a stupid comment that really angers husband/wife. Cue the other: ‘That’s it! You’re sleeping on the couch tonight!’” They note that it’s usually the wife who is doing the exiling. Some research supports the idea that it may be more fiction than fact. Paul Rosenblatt, a professor of Family and Social Science at the University of Minnesota, who wrote Two In a Bed: the Social System of Couple Bed Sharingin 2007, told me that in his interviews, which were admittedly small and consisted of about 50 couples, he found no significant difference between genders in who left for the couch or another bedroom if there was a fight. “But more women than men went to sleep elsewhere,” he noted to me in an email. “Never known of anyone who did it out of anger,” someone responded. “Parents of a friend did that because the dad snored.” And that overwhelmingly the responses — that it makes sense because of snoring or discomfort, or different work schedules. Rosenblatt cited similar reasons in his research for couples sleeping apart — menopause, a veteran with PTSD who thrashed about wildly in bed, and a woman whose husband threw his arms around in bed too much after he’d been drinking, so she slept elsewhere. As on Reddit, rarely did couples indicate that it happened because one spouse was so pissed at the other that they decamped to the couch. Michelle Janning, a sociology professor at Whitman College whose upcoming book The Stuff of Family Life: How Our Homes Reflect Our Lives, is due out May in this year, has researched the couch as a transitional object in terms of the family home. She says that even though about 25 percent of couples sleep apart, that it’s why they sleep apart that matters most. New research also suggests that while there are plenty of harmless reasons couples might sleep apart, going to bed angry and apart is not a great idea, and may make it a lot harder to get past the bad feelings later on. While we at MEL applaud trying novel approaches to avoid sleeping apart, we really, really hope he’s joking.